This morning I was reminded why I check my email, even on the weekend. A source inside B&N thought today was a good day to leak hints about Barnes & Noble's newest device, which it looks like they plan to call Nook Audio. I'm still not quite sure what this device is, but I do know several things about it. 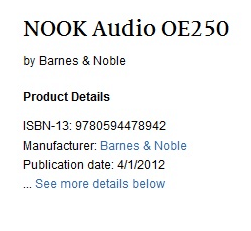 First, B&N filed trademark for "Nook Audio" back in February. I didn't post about it at the time because B&N was going through a phase where they trademarked everything (I think there was even a trademark for "Nook Kitchen Sink"). I didn't know which of the terms would be used, so I decided to wait and see what happened. Also, Barnes & Noble hasn't passed any new devices through the FCC, and the lack of FCC paperwork indicates that it won't be a Wifi equipped device such as an ereader or mp3 player. But I'm posting about it today because now I have the product page. There's hardly any info on it, but the fact it is there tells me that the product is coming. We also now have a model number, OE250, and that tells us a couple things. The model number is different from any of the Nooks, so this likely isn't a Nook with sound. It's probably not even an mp3 player; B&N would probably have built Wifi in and had it run Android (it would have been a mini Nook Color). So what we have here is an audio accessory. The Nook Touch doesn't have sound, so this would have to be for the NC or NT. It might be as boring as headphones, but I'm hoping for a stereo dock. A couple different companies have them in the works for the KF and Nook Color (here, here), so there's a good chance that B&N also thought now would be a good time to offer one. I wouldn’t place too much stock in the lack of an FCC listing. It might be tough to find if the wireless chip maker or some other component maker submitted it instead of B&N… or B&N might have submitted documents that haven’t been released to the public yet. Pretty much every time there’s a new iPhone or iPad, the documents are made available on the FCC website exactly the same day Apple officially announces the products. True, and one thing I’ve noticed about FCC paperwork is that sometimes it gets held for months after the testing is done before it gets filed on the FCC website. That’s what Apple usually does. It seems to me this is nothing more than a line of audio *accessories* — headphones, etc. Probably distinguished with the Nook brand due to some name-brand designers attached to them — and also to further inflate the Nook brand value so if they spin it off they can count this as part of it. That’s what I thought until this product listing showed up. Watch the page get populated with a frikkin *lineup* of accessory stuff. There is no way B&N will go after iPod market. Just ask Creative — and Creative actually got *money* from Apple in a lawsuit, FFS. It has an ISBN, so it’s not going to be a line of products. It’s one product. ISBNs are for books only, no? Yes and no. The Nooks also have ISBNs, though perhaps it might be better to call them UPCs. ISBNs are actually a subset of UPCs that start with 978, the country code for Bookland. There’s a third filing too. >>>We found 0 results for ISBN-13: 9780594478942. Please try another search or browse our recommendations below. Worked for me. I just tried it 10 seconds ago. Pfft. Try it again with just the number. Maybe you just got pWned? No, a lot of accessories have that date (in 2011, 2010, etc). Late to this article- I was gone this weekend. Good work Nate, and tipster! In response to a question about plans for the nook. I think he was hinting that they may create their own music/ movies download service for the nook color and tablet. Which probably would not merit the term “innovative” -every other tablet already has those two things- if not for the fact that it’s Barnes and Noble. Could be related, or not. That being said- if they ARE creating a music service- it would make perfect sense for them to go after the premium headphone market in conjunction. Music downloads aren’t profitable on their own- they need to be paired with a high margin product like cloud services in order to be profitable- but since Barnes and Noble doesn’t have data centers to create a compelling cloud product, they’ll need some other synergistic product. The nook was designed by the same guy who created the jawbone earpiece- those sell for $140 and I think the markup is something like 200%. BN could cut the price in half and still have fat margins. And they can use their stores to demo any physical product. I’m curious by your assertion that music downloads aren’t profitable but “cloud services” are. Could you elaborate a bit? I spend hundreds of dollars a year on music, but no money on cloud services. Am I somehow a leech customer for my preferred store? What high-margin, cloud services relating to music are people paying lots of money for?